If you’re like me, you have countless stories of all-day prep-a-thons, followed by the all-day cook-a-thons that precede a big sit-down dinner for family and friends. And when a holiday meal is in the works, the pressure increases with the number of place settings. The rest of the time, though, most of us are just looking for tasty meals that don’t eat into busy schedules and are relatively fuss free. Grill salted chicken breast in a pan brushed with a little olive oil till cooked through, let rest on cutting board. Meanwhile, boil pasta according to package instructions, drain, then return to pan over low heat and add the tablespoon of olive oil and grated cheese. (The microplane makes a fine, gossamerlike grate that keeps the dish light.) 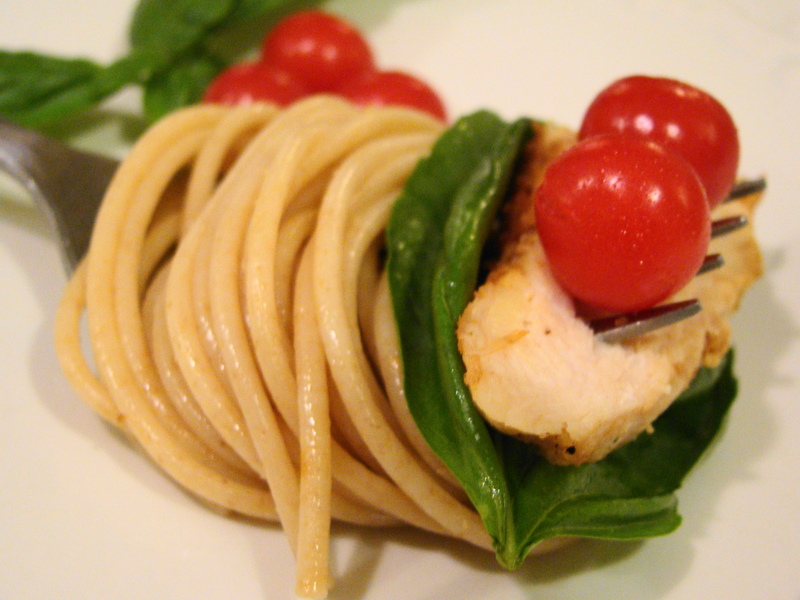 Cut chicken into strips and add to pasta. Fold in tomatoes and basil then transfer to platter and serve immediately. Top with freshly ground black pepper, if desired. Serve with a salad of mixed greens topped with a lemon vinaigrette, and your bread of choice. Very aromatic and a little cheessy recipe. Yummy! This is definitely one recipe which I am going to try. It sounds delicious. Your photograph made me hungry – immediately!! This sounds so yummy and even “light”. We are harvesting our basil. This sounds like a great recipe to try. Let me know how the recipe works for you. And Miss D, let me know what other things you make with your basil. I’m going to post my pesto recipe one of these days. Welcome back, and thanks for the comment on the picture. I have a new respect for photo stylists after trying to get decent shots of food! Oh yum. I love simple pasta recipes. Who needs to slave over tomato sauce when you can eat this! I wish I could pop that bite right into my mouth! I also love a simple pasta dish. I do eat poulty but I don’t really associate chicken with a simple pasta dish like this. I don’t know why. Anyway, it reminds me of a dish my sister made recently. She’s a vegetarian and I think it’s…Morningstar that makes grilled and seasoned veggie chicken strips you could just throw in. It would be delicious in this nice simple dish you offer. The veggie chicken strips would be a great substitute in this dish. That’s what I love about experimenting with recipes, you make them your own with changes that suit your lifestyle! Hi Avis. This looks delicious. I am harvesting my small bit of basil today (frost predicted for tomorrow night) and I definitely want to try your recipe with it. I love something quick and easy yet tasty. Thanks for sharing it. Your lisianthes look beautiful. I’ve never done well growing them but you’ve certainly mastered the trick.